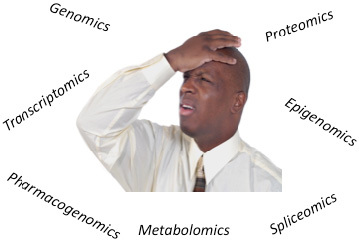 'OMICS' is a coined phrase and refers to a field of study in biology that ends in the suffix - omics, such as genomics, proteomics or metabolomics. Throughout most of the twentieth century, science has been reductionistic. Reductionism is an approach to understanding complex things by reducing them to simpler or more fundamental things such as individual genes, proteins etc. Researchers worked in their individual labs and only shared or discussed their work once it was published. Once the human genome was categorized, a large increase in data was generated and new approaches emerged. The 'omics revolution began to characterize individual fundamental things and study their interactions with each other. Researchers began to collaborate more often between fields and with each other. Taking this broader approach even further, biology is moving to an ever more integrative approach reflected in systems biology. This approach is leading us toward personalized medicine. We have included both of these topics here.